FOG, as it is called in the wastewater industry, is composed of fats, oils, and grease. These fats, oils, and greases are found in your kitchen, and washed down your kitchen sink. Cooking oils, animal fats, lard, butter, margarine, shortening; all used in food preparation and a natural side effect of cooking and baking. As the grease from dinner swirls down the kitchen sink, it may not seem like a big deal. However, fats, oils, and grease are causing serious issues in wastewater treatment plants and their collector systems (the series of pipes and pumping stations used to bring the wastewater to the treatment facility) across the United States and the world. Fats, oils, and grease are causing not only blockages, but costly repairs. ​Fats, oils, and grease are not soluble in water. FOG is a hot liquid as it goes down the drain, but it doesn't stay that way. As the oil and grease cools, it solidifies and coats the sides of the pipes. As more oil and grease is washed down the drain, it builds up in the pipes, eventually leading to a blockage. This blockage can cause a back-up in your home and, depending on the location of this blockage, your neighbors' houses too. The fat, oil, and grease that happen to make it through the pipes into the pumping stations and wastewater treatment facility cause even more problems. It takes more pumping power/electricity to pull sewage through partially blocked sewage lines, therefore increasing the electricity bill. At the pumping stations, FOG can cause the pumps to clog. This causes back-ups along the sewer line and can lead to overflows not only into homes and local businesses, but into the roadway. Not only is this unsanitary for the public and the environment, the District can be fined from the Maine Department of Environmental Protection. If the FOG reaches the wastewater treatment facility, not only can it clog the pumps, but can negatively affect the treatment process in many ways. Fresh grease doesn't settle. That fact can harm not only to the system, but to the environment.The grease attaches to the sludge in the system, causing the sludge to "pop." Instead of the sludge settling as it is supposed to, it rises to the top of the water. This sludge can end up going out with the clean water, causing not only violations and heavy fines, but environmental hazards. The secondary clarifier is where the sludge is settled out of the system.If there is FOG in the sludge, it can cause the sludge to rise to the top, and leave with the separated water. FOG can attach to various analyzers in the system that are used to make sure the process is running smoothly and that the wastewater is being treated effectively. Not only does this mean that the analyzers need to be cleaned more often, but could result in more chemicals being used to treat the wastewater. FOG can coat the inside of the dewatering machine, not allowing the water to leave the process; instead it drains into the dumpster with the "dewatered" sludge. Grease in the sludge increases the amount of polymer (the chemical used to remove water from sludge) used, as does the landfill tipping fees. 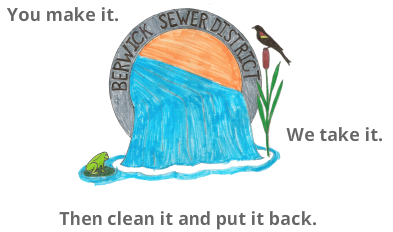 Just because more polymer is being used doesn't mean that enough water is being removed before having the sludge hauled off to the landfill. . Between that and grease coating the dewatering machine, excess water is put into the dumpster with the "dewatered" sludge. Fats, oils, and grease are costly once they goes down the drain. There are many things that you can do to help curb the grease problem and reduce the resulting extra cost. Follow these practices in your kitchen to help reduce grease buildup and the resulting problems. 1. Do not pour hot grease or oil down the drain. Instead, pour the used grease or oil into a container with a lid. Once full, dispose of the used grease/oil in the trash or bring it to a recycling center. 2 . Do not wash food scraps - meat trimmings, dairy products (i.e., butter, margarine, ice cream), salad dressings, mayonnaise, gravies, marinades - down the drain. Instead, scrape plates into the garbage can. 3. After cooking meat, do not pour the excess liquid (fat) down the drain. Instead, pour the liquid into a container and dispose of the container in the trash. 4. Cooking or baking with butter? Margarine? Lard? Shortening? Any sort of cooking oil? Wipe out the pan or bowl with a paper towel (& toss that towel in the garbage!) before washing. 5. Restaurants! Make sure there is a grease trap installed and it gets cleaned often and at a regular interval. If you have any questions, please contact us.